Iranian Foreign Minister Mohammad Javad Zarif and US Secretary of State John Kerry will meet in Geneva this weekend for talks on Tehran's nuclear programme, an Iranian official said Thursday. Iran and world powers are trying to strike a deal that would prevent Tehran from developing a nuclear bomb, a goal it denies having, in return for an easing of punishing economic sanctions. Zarif and Kerry will hold two days of discussions from Sunday after their diplomats begin bilateral talks on Friday, Iran's deputy foreign minister Abbas Araghchi said. "After four days of bilateral discussions between the Iranian and US nuclear delegations, they could continue with the participation of all members of the P5+1," Araghchi was quoted as saying by the official IRNA news agency. He was referring to Britain, China, France, Germany, Russia and the United States, which are seeking to thrash out a complex deal with Iran. "These bilateral consultations will take place in the context of the P5+1 nuclear negotiations with Iran," the US State Department said, adding that the European Union's deputy foreign policy chief Helga Schmid would also join the talks. Tehran denies ever seeking atomic weapons but Western powers are unconvinced its activities have been solely aimed at peaceful energy production, particularly since several aspects of its nuclear program have no peaceful application. Under an interim deal struck in November 2013, Iran's stock of fissile material has been diluted from 20 percent enriched uranium to five percent in exchange for limited sanctions relief. But skepticism is mounting about whether a permanent agreement is possible, after two deadlines for a comprehensive deal were missed. Zarif has met multiple times with Kerry, most recently in Munich earlier this month on the sidelines of a global security conference, when both spoke out against any further deadline extensions. Negotiators are now working toward reaching a political framework for a deal by March 31, with the final technical details to be laid out in a comprehensive accord by June 30. Iran's supreme leader Ayatollah Ali Khamenei has voiced opposition to the two-stage accord process. "Any agreement must come in one step, and include both a general framework and details" of a deal, he said earlier in February. China's Foreign Minister Wang Yi, speaking in Tehran last week, said the negotiations had seen "positive progress" but had become "more difficult and complicated" as they near conclusion. Israel, the region's sole if undeclared nuclear-armed state, reiterated on Thursday its opposition to the negotiations between Tehran and the West, and renewed its accusation that Iran is seeking a nuclear bomb. 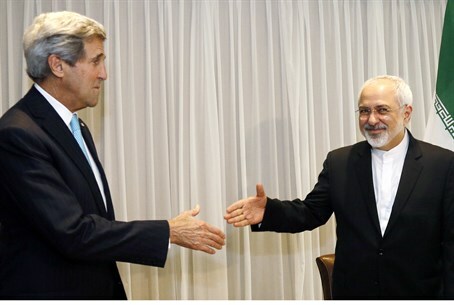 "The Iranian regime aspires to acquire nuclear capability. This regime has to be stopped," Israeli Defense Minister Moshe Yaalon said during a visit to India. "Iran is the main instigator of instability in the Middle East," he said, referring to Tehran's sponsorship and backing of numerous terrorist organizations throughout the region.